A copy of the book, That Little Voice in Your Head: Learning about Your Conscience was provided for my review. Please see my disclosure policy. My husband and I have been parents for almost five years now. The days and moments pass so quickly, and it seems impossible that five years have come and gone, but they have. I think parents who endeavor to rear their children in the ways of the Lord and His Word would agree that none of us has this parenting thing figured out completely or even partially! We are in desperate need of the Lord’s guidance as we make parenting decisions regarding thousands of matters! As a teacher and a mom of little people, I’m often on the lookout for resources to help myself and also those near and dear to my heart. I love children’s books, and I especially like books that influence children for eternity. Reading aloud is one of the most valuable things a mom can do with her children. 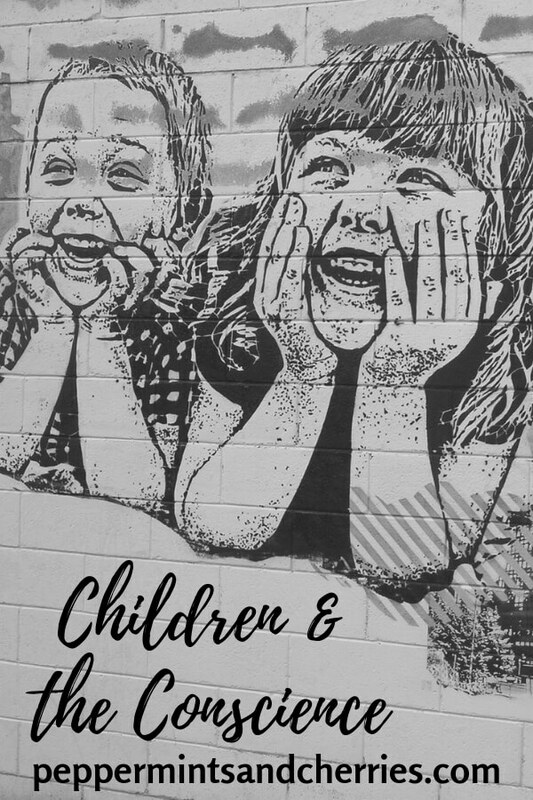 This practice opens a world of opportunity for both the mom and the children to explore new places, learn life lessons, develop character, grow deep bonds, and make cherished memories. Not long ago, my husband read a book that was recommended by a friend, Conscience: What It Is, How to Train It, and Loving Those Who Differ, by Andrew David Naselli and J.D. Crowley. I have not read this book, but my husband benefited from reading it, and it is on my book list! The authors examine the 30 New Testament passages dealing with the conscience to help readers train their consciences in a biblical way and relate to others regarding matters of the conscience. 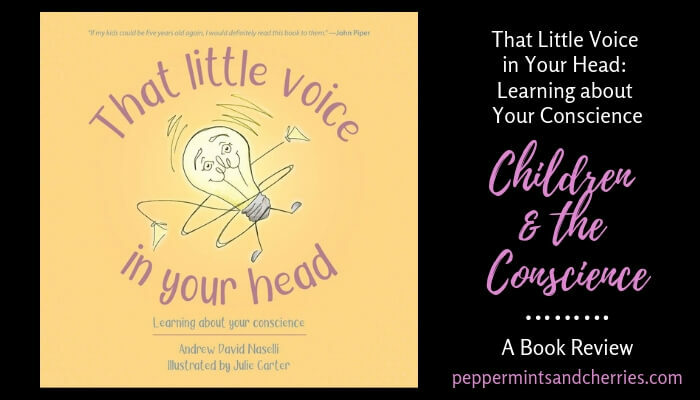 When I discovered the children’s version of this book, That Little Voice in Your Head: Learning about Your Conscience, I was over the moon excited to read it! Why? I have many hopes and dreams for my children, but my end-all as a mother is to lead my children to Christ. Do I lose sight of this goal at times? Yes! Am I a perfect mom? No way! Do I make mistakes? Yes! However, my children are my number one mission field. Children may eat the healthiest meals, make the best grades, and wear the nicest clothes, but if they die without Christ, the noble efforts of motherhood were in vain. This short life is preparation for eternity, and eternity is forever! Christians are commanded in Scripture to share the gospel with others. This begins with our own children, and there are many ways we fulfill this responsibility—attending church, praying, reading God’s Word and Bible story books, singing songs, talking about God’s love and character, asking forgiveness of our children when we make mistakes, and surrounding them with godly influences. Ultimately, we can’t choose Christ for our children or make them choose Him. Every individual has a free will to choose or reject Christ, but we need to do our part in evangelizing those entrusted to our care. My children are ages two and four, so the value of the children’s book, That Little Voice in Your Head, is just beginning. It is a tool to be used for many future years as my children grow and mature in their knowledge and understanding of God and His Word; nevertheless, most of the book is applicable to them even at a young age. On a side note, a well-written children’s book needs aesthetically pleasing illustrations, and Julie Carter has done a beautiful job relaying the messages and emotions of the book through pictures. She cleverly used a light bulb graphic to visually represent the conscience. This was an ingenious way to help children “see” the conscience in a tangible form. The author, Andrew David Naselli, uses appropriate biblical principles to speak truth into the hearts of impressionable children and teach them on an age-appropriate level. 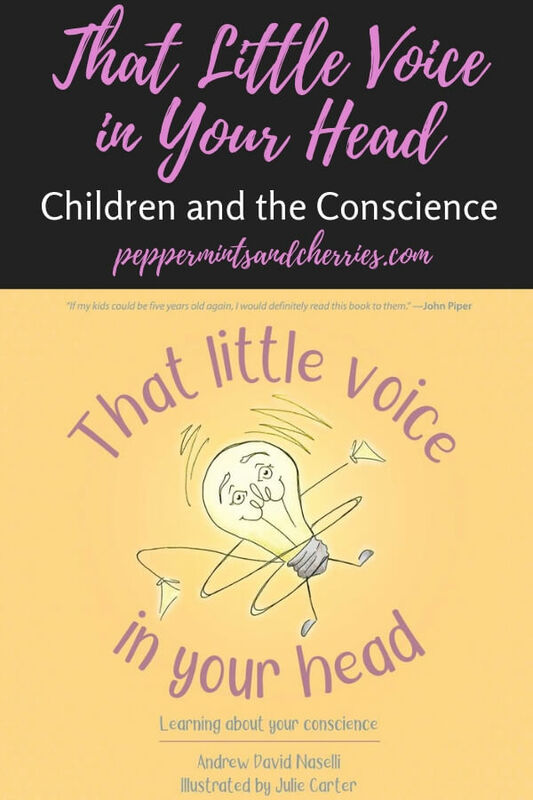 The first time I read That Little Voice in Your Head: Learning about Your Conscience to my children, my husband and I used it as part of our family bedtime devotions. Due to the length of the book and ages of my children, I divided it into four readings. After each section we discussed what we read, and I asked questions to find out how much they understood. Obviously, my four-year-old understood more than my two-year-old. We can never begin planting seeds in little hearts too early, so I know my daughter benefited as well. It’s that little voice in your head that tells you whether something is right or wrong… God gives everyone a conscience. It’s a gift. After reading the first section of the book I asked my four year old son, What is your conscience? I then said—What does it tell you? I also asked him what he learned. His reply—You have to obey the light bulb! He clearly understood the message through the use of child-friendly illustrations! After Emma and her mother talked about what the conscience is, they also discussed how Jesus can clean our conscience if we turn from our sins and trust Him to save us. This part of the book provides parents with an opportunity to discuss the gospel—planting seeds or giving children an opportunity to respond to the message of salvation. I especially appreciate the author’s use of the songs, Nothing but the Blood and Before the Throne of God Above in this part of the book. My family took time to sing the songs and listen to the message of the gospel through music. Emma also learned that family rules are not necessarily Bible rules. A family may have rules that other families do not have—rules such as no shoes in the house, making the bed, or washing hands before dinner. Emma’s mother explained that children must obey their family rules because the Bible tells children to obey their parents, and each family has its own set of rules that parents think are best for their family. Even though this section was a little “deeper” for a young child, I believe my son understood the principles and could relate to them. Emma’s mother also talked to her about the conscience and how it can give us a false sense that something is wrong when it isn’t. It can also make us think things are okay when they are indeed wrong. She explained the importance of making the conscience work better by reading the Bible and teaching the conscience what is true so we can call good things good and bad things bad. This portion of the book was a little more difficult for my son to totally grasp, but as I said previously, the benefits of this new book are just beginning in our home! We will be reading That Little Voice in Your Head many more times! The last few pages of the book give a short recap and end the story with Emma eating chocolate chips with her mother’s permission, a perfect way to show the rewards of obedience. Listed below are four questions I asked my four-year-old son after reading That Little Voice in Your Head: Learning about Your Conscience. I also included his answers. Does your conscience tell you when you do wrong? Give me an example of a time when your conscience said you did wrong. Yes, and I helped him think of examples such as disobeying, hitting his sister, or eating cheese sticks or cookies without permission. I definitely know this book has influenced and will continue to influence my entire family, especially since I recently overheard my son tell my daughter, your conscience told you not to do that!!! On a serious note, I am grateful for authors and illustrators who take time to develop tools to assist Christian parents in our ultimate mission as we lead our children to accept Christ as Savior. Purchase That Little Voice in Your Head: Learning about Your Conscience at Christian Focus Publications or Amazon. One of my favorite parenting resources is Paul Tripp’s book, Parenting: Fourteen Gospel Principles That Can Radically Change Your Family. In this book, the author provides a wealth of knowledge for parents through stories, personal examples, and biblical principles. This book was and continues to be one of the most helpful books I have read on the topic of parenting.